The Greek economic crisis - in pictures, a set on Flickr. 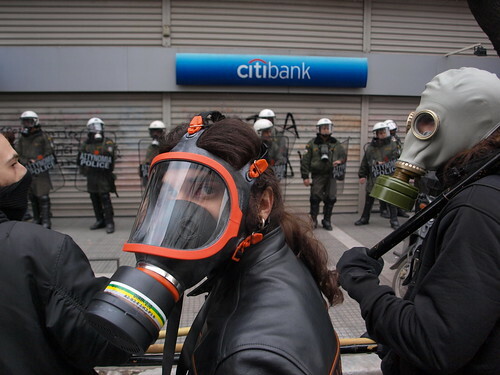 How much more can Greece take?, a photo by Teacher Dude's BBQ on Flickr. Another day, another government announcement of yet more taxes and job cuts. So far there have been five seperate initiatives in the last two weeks and yet more moves by Athens lay ahead in order for the Greek government to placate its creditors. In such an atmosphere people have no idea what the future holds for them, planning any kind of budget as a family or business has become virtually impossible as no one knows that kind of new bills are coming their way, what their salary will have or even if they'll have a job in the coming months. On the other hand the poorer off are been crushed by a vice consisting of falling wages on one side and rising prices on the other. Here in the north where winters are much cooler than one usually associates with Greece (we're just 130 km south of Bulgaria) the 50% hike in tax on heating oil combined with large increases in electricity prices are going to push many families into fuel poverty this winter. Officially, unemployment in Thessaloniki is 21%, but studies carried out by GSEE (Greece's answer to the UK's TUC) put that figure at 5-8% higher with no prospect of any decline soon. Indeed the figures are guaranteed to go higher as tens of thousands of public sector workers are laid off and the continued fall in domestic consumption carries on apace. Since the start of the year 17% of shops in the centre of Thessaloniki have closed down and store owners are claiming a drop in sales of 50% in the last three years. In areas outside Thessaloniki's bustling downtown shopping district the picture is even grimmer with business organisations in the poorer western districts of the city reporting a fall in turnover of 80%.While some of this may be exaggeration many commercial thoroughfares such as the westbound Langada Street have indeed been decimated with 70-80% of shop fronts either boarded up or sporting For Sale signs. Public confidence in the government of prime minister, Giorgos Papandeou has hit rock bottom as his party drifts to gaffe to gaffe, seemingly unable to do more than issue garbled public statements which raise more questions than they answer. 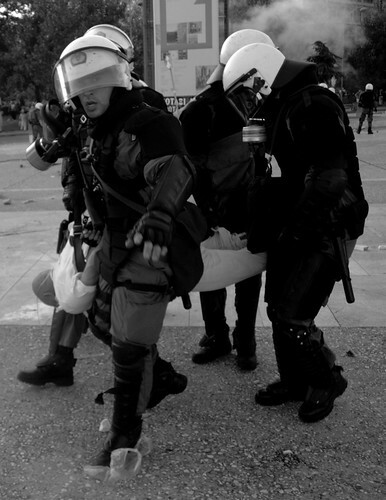 Greek riot police arrest protesting taxi driver during Thessaloniki Trade Fair demonstrations, a photo by Teacher Dude's BBQ on Flickr. Green activists in Pristina, Kosovo demanding alternatives to coal powered electricity plants, a photo by Teacher Dude's BBQ on Flickr. 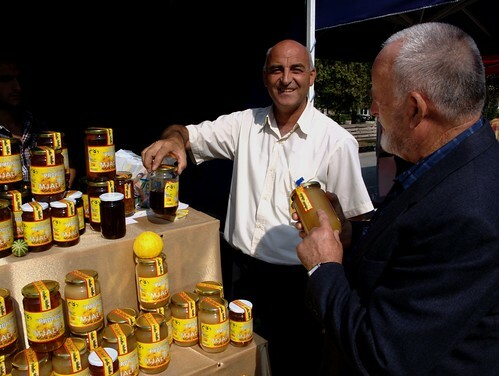 Honey Sellers in central Pristina. Kosovo. 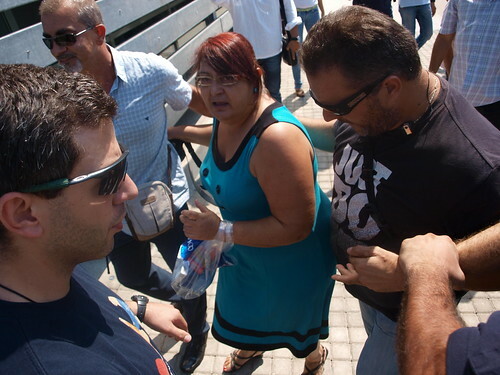 Greek teachers protest lack of school books, a photo by Teacher Dude's BBQ on Flickr. A march called by students and teachers protesting controversial education reforms.Around the woman's neck is a DVD that ministry of education sent instead of school books to classrooms around the country. Unfortunately, there is no way of using the material in lessons as most state schools have just a handful of PCs. There's a storm coming, a photo by Teacher Dude's BBQ on Flickr. 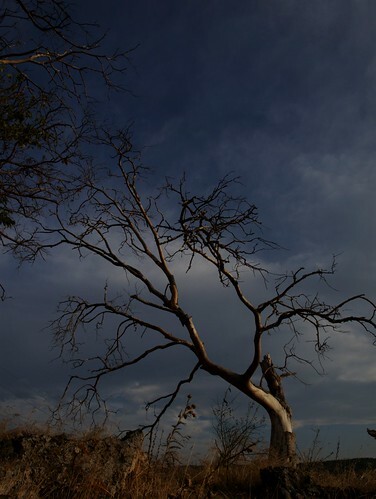 A sombre picture for a sombre time. Once again Greece awaits what is in store for it in terms of spending cuts and job losses. In the media rumours abound of how hundreds of thousands of jobs are at risk and the possible imposition of yet more taxes on basics such as public transport and heating oil. All the while the political leadership shows how little the fate of the country depends on decisions taken by Greece's government and parliament. In response protests by ordinary Greeks are slowly gathering steam as people are driven by anger and desperation over the future to express their anger over how they are being treated. Evangelos Venizelos, a photo by Teacher Dude's BBQ on Flickr. Over the last two days it seems that the Greek government has been in tense negotiations with the IMF and EU partners over the conditions attached to the country's sixth bailout installment. The local media has been cutting into normal programming to report even the the slightest update over the state of play. In an address to the nation on Sunday, deputy prime minister quoted Churchill to show quite how serious the situation Greece was facing. 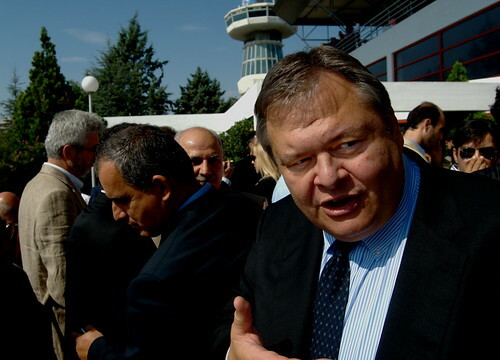 In Venizelos's opinion anything but a united front by Greek political parties, academics and the media would lead to disaster and in a fierce attack on critics he stopped just short of accusing those opposed to the austerity measures of treason. So considering the atmosphere of supposedly feverish negotiations it came as more than a surprise when the IMF's official spokeman said that Athens's creditors had in fact demanded no new cuts or taxes but rather that the ruling PASOK government applied measures that had already been agreed upon in summer. And there you have so many of Greece's problems in a nutshell. The country's political elite, even as the situation deteriorates even further still continues playing the same old games.Like generals fighting the last war, the leadership of PASOK still thinks it can fob off foreigners with promises it cannot keep while fobbing off domestic critics with talk of victories won. However, this particular web of half-truths, fudges and outright lies is about to crumble as it becomes more and more apparent that Athens hasn't the political power to stop massive cuts in public services and pay. On the other hand local trade unions, public sector workers and huge swathes of the population facing yet more tax hikes are at breaking point. After three years of recession pockets are empty, people are desperate and anger at the mendacity and ineptitude of the country's political class is at an all time high. Even before the present debt crisis public confience in the political system was low following the seemingly endless series of corruption scandals that dogged the conservative New Democracy's five years in power. Even by the abysmally low standards of Greek politics the Karamanlis administration had reached new depths of veniality, helped in part by laws drafted by present deputy PM Venizelos protecting ministers from prosecution. Both major parties are polling historically low and are struggling to get more than 20% of the vote. Nor have the smaller parties both of the left and right been able to capitalise on this trend. Instead there has been a widespread sense of disgust which is signalling a seachange in Greek political life.The current politicial set up is in crisis and despite frantic claims to the contrary no one is clear about how to get Greece out of the hole it finds itself. 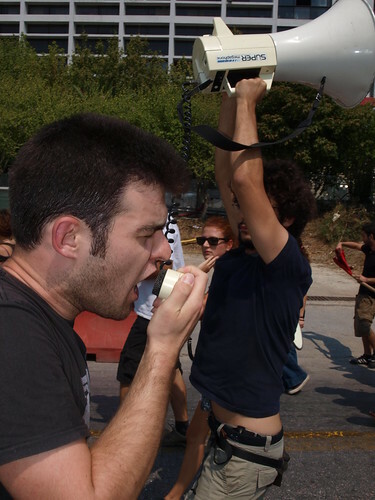 Outside the hermetically sealed world of party politics however, protests movements are being created that promise to challenge prime minister Giorgos Papandeou's plans. Even the traditionally pro-PASOK public sector trade unions are promsing a long drawn out fight over cuts in pay, conditions and numbers. A battle that will intensify once details of lay-offs involving 100,000 civil servents are announced this week. This measure is deeply dispised as it is seen as little more than a legislative smash and grab that will includes the unemployed and disabled but not the nation's second largest property owner, the Greek Orthodox Church. Just today there are at least three major demonstrations being planned in central Athens, a number that is likely to rise as the full extent of Athens's new austerity measures beome clear. Venizelos may have compared himself with Winston Churchill on Sunday however, Marshal Petain, leader of the puppet Vichy French regime during World War Two seems a much closer historical fit, given how much national sovereignty has been surrendered propping up an economy on the brink of collapse. Reporters Sans Frontiers on reporting in Greece: "Photographers and cameramen are more and more at risk as they encounter situations akin to civil war"
Reporters Sans Frontiers on reporting in Greece: "Photographers and cameramen are more and more at risk as they encounter situations akin to civil war", a photo by Teacher Dude's BBQ on Flickr. "The impact of the crisis has radicalized a sector of the population, which expresses its anger and frustration in increasingly violent demonstrations. Photographers and cameramen are more and more at risk as they encounter situations akin to civil war in the course of trying to cover the activities of these grass-roots movements. Caught between the violence of the extremist movements and the violence of anti-riot police who show little respect for their professional status, photographers are paying a high price for the coverage they give us." 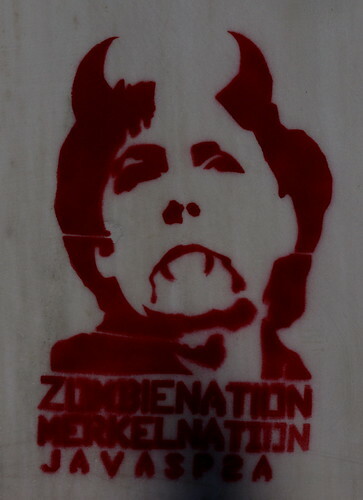 Zombie nation, Merkel nation . Stencil on the wall of a building in Thessaloniki, Greece, a photo by Teacher Dude's BBQ on Flickr. 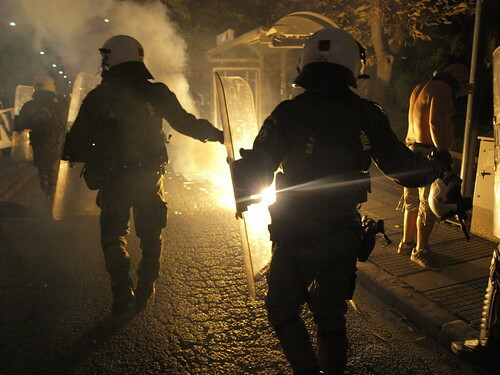 Greek riot police clash with anti-government protesters outside Thessaloniki trade fair, a photo by Teacher Dude's BBQ on Flickr. The Thessaloniki international trade fair, or Helexpo as it is known locally has traditionally been the chance for the country to present its best face to the outside world. However, this year's event was overshadowed by violent anti- government protests organised by groups as disparate as taxi drives and doctors, football fans and soccer moms, all angry with austerity measures which have crippled the economy and brought about a financial downturn unprecedented in modern Greek history. Prime minister. 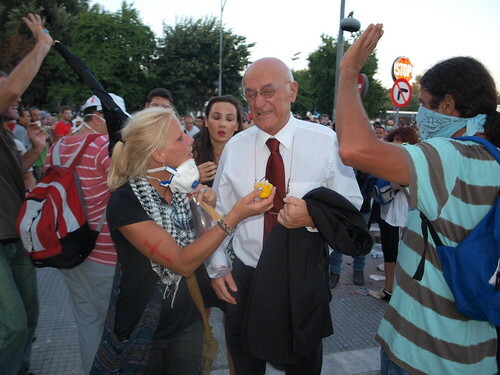 Girogos Papandreou gave is annual speech at the fair, the nearest thing Greece as to a state of the union address from behind a security cordon manned by 10-12,000 riot police armed with shields, tear gas and pistols. The centre of Greece's second largest city of 1,2 million inhabitants was sealed off for one kilometre around the Vellidiou conference centre where the prime minister was scheduled to speak. In the end the most violent protests came not from the city's large student population or anarchists but rather taxi drivers outraged by government reform measures. For over an hour thousands of driver fought with riot police units outside the trade fair. Round of tear gas fired by the police were met with a hail of broken paving stones and several times forced them to retreat to the relative safety of the fair. 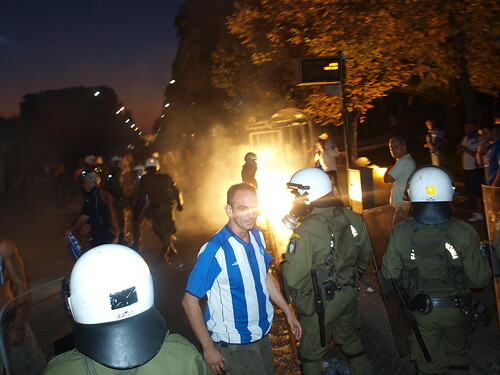 To add to the authorities woes thousands of football fans also clashed with police units in the centre as the local Iraklis FC supporters smashed shop windows and set fire to rubbish bins along the main Tsimiski Boulevard. 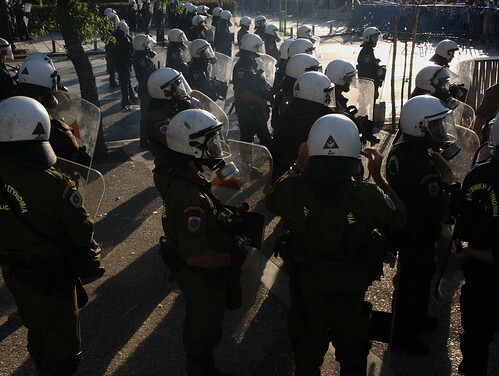 Clashes between students and police around the Aristotelian University of Thessaloniki which borders the trade fair also lasted into the small hours of the morning. Everything you ever wanted to know about how Greek media works in one photo. 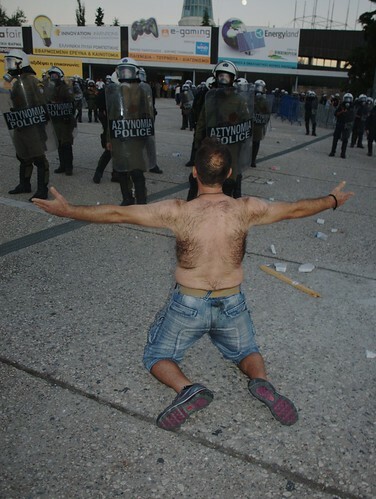 Everything you ever wanted to know about how Greek media works in one photo., a photo by Teacher Dude's BBQ on Flickr. In the foreground a local TV news program with riot police forming a line to prevent protesters moving forward to demonstrate against Greek prime minister's visit to Thessaloniki town hall. The media here, especially that funded by the state (as is the case with the station pictured above) is little more than publically funded propaganda designed to present those in power in the best possible light. Dull, biased and impossibly amateur these channels pump out a daily diet of press announcement and valedictory speeches which the vast majority of viwers simply ignore. Since selection and promotion within such organisations depends on connections (bothe personal and political) and above loyalty to ones superiors quality and talent are often after thoughts which explains why so much money buys such bad TV. 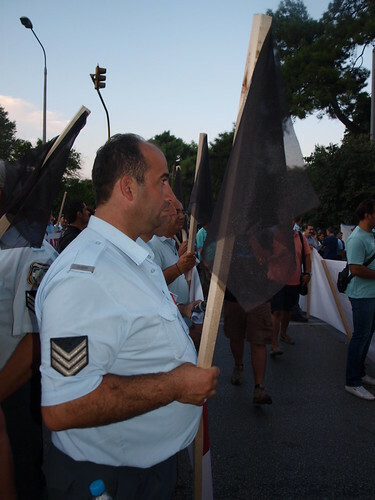 Greek police protests against overnment austerity measures in Thessaloniki, a photo by Teacher Dude's BBQ on Flickr. Woman employee grabbed by plain clothes police officers for taking photo of police infiltrators, a photo by Teacher Dude's BBQ on Flickr. Greek prime minister, Giorgos Papandreou is visiting the country's second largest in the run up to his annual address to the nation which traditionally marks the opening not only of the international expo but the new political season. With coffers empty and yet more austerity measures soon to be imposed Papandreou's popularity is at an all time low as groups as diverse as dentists and taxi drivers, cleaners and surgeons are taking part in anti-government protests. The city centre resembles less a trade fair than a city under seige with thousands of quasi-military riot police on stand by around strategic public buildings and the Makedonia Palace hotel where the prime minister and much of the cabinet will be staying for the weekend. The real show of strength will be tomorrow when thousands of demonstrators have vowed to shut down the centre and do everything in theirpower to prevent the beleagured leader from giving his key note speech to the nation. 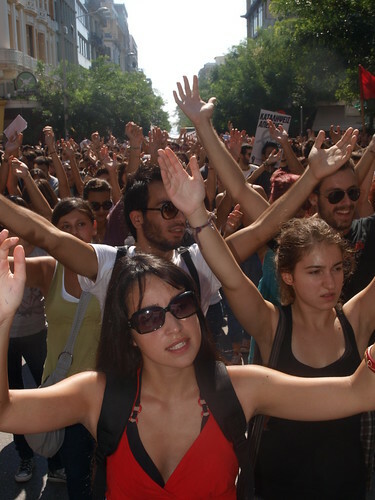 Greek students continue protests against controversial reform plan. 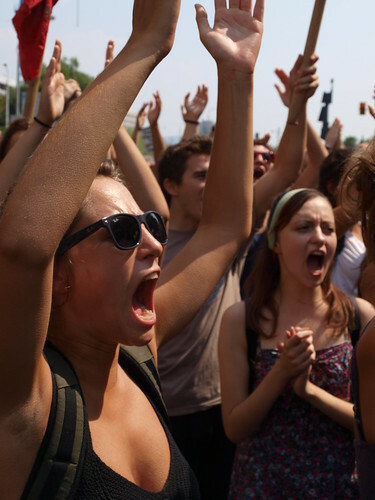 Greek students continue protests against controversial reform plan., a photo by Teacher Dude's BBQ on Flickr. 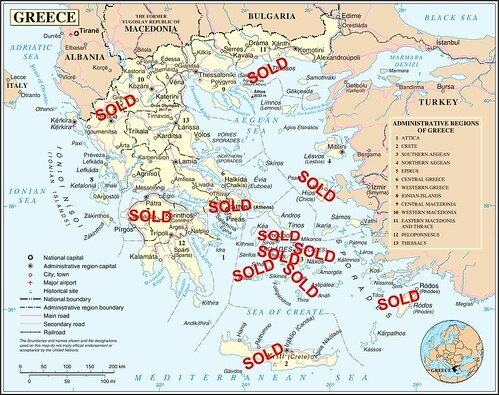 Greece's ambitious new privatisation plan revealed, a photo by Teacher Dude's BBQ on Flickr. 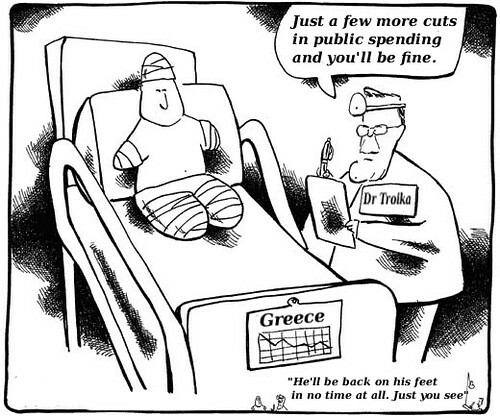 Greece is cutting public spending to the bone, a photo by Teacher Dude's BBQ on Flickr. "award-winning newswire where YOU tell the stories. We put photos and video from ordinary people and freelance photographers into the international news media." When I started to upload photographs and news stories I was hoping that the site would be a serious replacement for other citizen journalism news hubs I had previously worked with. I was hoping that unlike these others Demotix would not degenerate into a centre for crack pot ideas and conspiracy theorists desperately trying to convince us that Hitler's brain was living on Mars. In that respect Demotix has suceeded by retaining editorial control over content and judicious choice of what stories it promotes. So why am I leaving? The first and most obvious reason is the seemingly endless list of technical difficulties that mean uploading photographs (forget video,where problems grew exponentially) and stories can take hours and many repeated attempts. If you're sitting in the comfort of your own home, an hour of two wasted now and then may not mean much but when uploading more often or you're outside in difficult conditions, such delays are infuriating.I remember cursing the site with every swear word I possess in both English and Greek when trying to upload a story from the Athens riots which was written on a rapidly dying laptop in an arcade filling up with tear gas. Despite recent attempts to improve. every upgrade simply changes the nature of the bugs rather than their frequency, it seems. The last straw was on Friday when an entire story just disappeared from before my very eyes never to be seen again. With my main job about to start again I do not have the time to spend two, three hours nursing a story through defective software. The other problem I have with Demotix is over payment or rather the lack of transparency over what is being sold, where and for how much. By chance I happened to come across some of my images that had been licenced to the Wall Street Journal and some Danish news sites yet no mention was made of this either via my account on Demotix or email. Later a member of the Demotix staff assured me that all the details of these transaction would be made available to me within the following days. That was over a month ago and still no update of my sales has appeared in my account data in Demotix. As you can imagine this lack of feedback is both disappointing and frustrating and has confirmed my decision that Demotix is not the place for me. 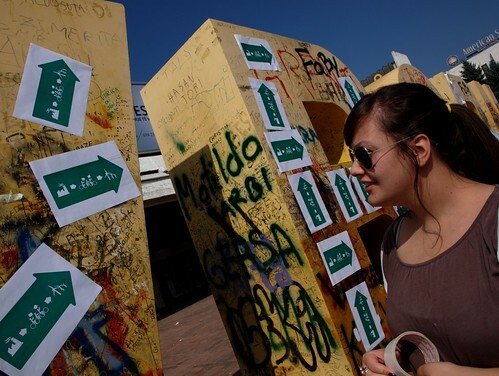 Greek students take to the streets to protest controversial education reforms, a photo by Teacher Dude's BBQ on Flickr. 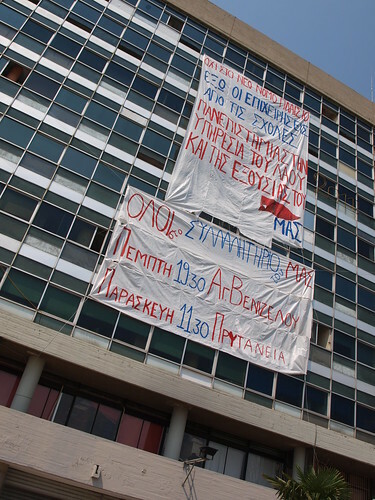 Over 300 university and polytechnic departments now under occupation by Greek students, a photo by Teacher Dude's BBQ on Flickr. Amongst the most contested elements in the reform package is the abolition of the country's campus asylum laws whch mean that the police are only allowed to enter university/polytechnc proprty at the inviation of the dean. Such laws ahve long been a thorn in the side of the authorities as it means that institutions of higher education are essentially off limits to the police. Today students took part in demonstrations nationwide, in the northern port city of Thessaloniki between two and three thousand students marched peacefully through the centre of the city. The latest wave of protests in yet another headache for the ruling PASOK party whose austerity measures have been opposed by an ever widening section of Greek society and has seen groups as diverse as taxi drivers and doctors clashing with the authorities. With popular support at record low levels prime minister Giorgos Papandreou attempts to implement deeply unpopular economic measures demanded by the IMF and EU are in danger of failing completely. 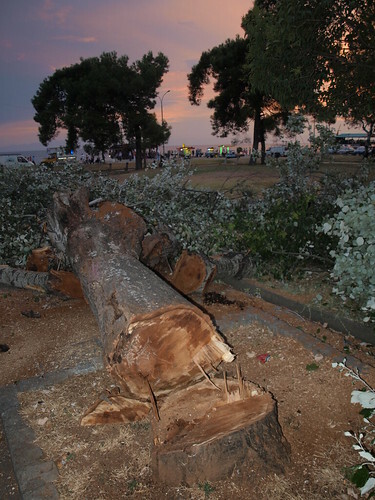 TThessaloniki city council in tree attack, a photo by Teacher Dude's BBQ on Flickr. It's that time of year again. The 76th Annual Thessaloniki Trade Fair approaches once again and the local political hacks, in order to look good for their political masters in Athen look to spruce up the city. Usually, this takes the form of expensive vanity projects within walking distance of the trade fair and the hotel in which the prime minister and the rest of the cabinet stay. A tradition that the current PM is unlikely to break given the problems with public order that are caused every time high raking government official appear in public. This year in order to do something the local town council has decided to lop down a number of fine old trees in the part near the hotel and build a "sculpture park". In a time of direst austerity, in a city where one in four is without work and many do not have the money even to pay their power bills such vandalism and extravagance is a public slap in the face and yet another reminder of how far the country's political leadership is out of touch with the average voter.